The average fuel economy for new vehicles increased 0.2 mpg to 25.4 mpg in March, according to the University of Michigan's Transportation Research Institute. The increase was attributed to "the increased gasoline prices from February to March," according to the report produced by the institute's Michael Sivak and Brandon Schoettle. The average window sticker number for new cars, trucks, SUVs, and vans has been inching up in 2015. In December, new vehicles sold recorded an average of 25.1 mpg. 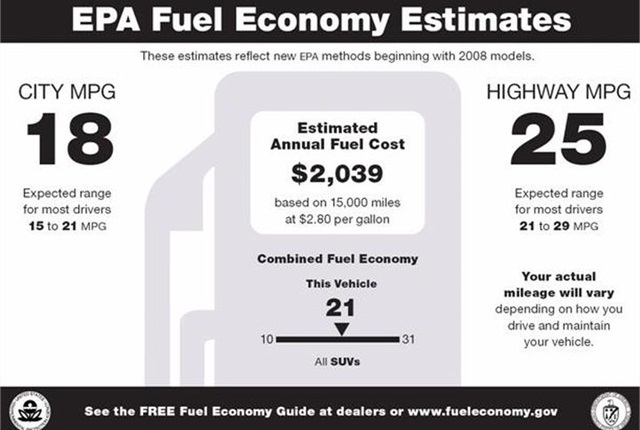 Average window-sticker fuel economy peaked at 25.8 mpg in August of 2014. The University of Michigan Eco-Driving Index (EDI) — an index that estimates the average monthly emissions of greenhouse gases generated by an individual U.S. driver — reached 0.82 in January, unchanged from the value for December. A lower value is better. This value indicates that the average new-vehicle driver produced 18 percent lower emissions in January than in October of 2007.